Full disclosure: I’m a Garrett gal. My first three machines were Garrett models, by default for the first two (they were gifts) and intentionally for my current machine, an AT Pro. 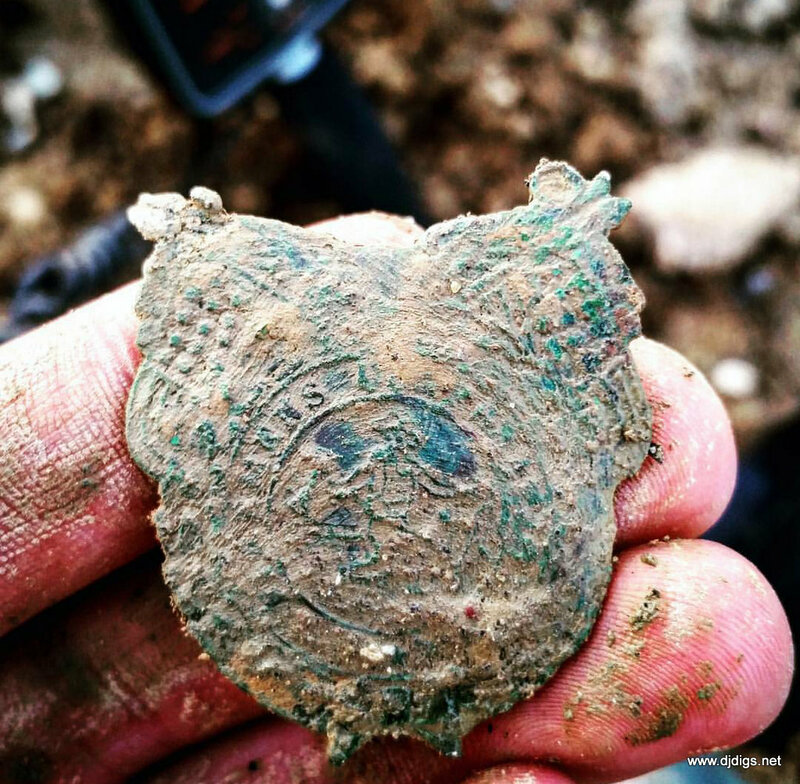 This is germane to the review, because I’m going to do some comparison, since those are the machines I know well, and because I’m aware that many beginning-to-intermediate detectorists use those machines. I love my Garrett Ace 250, and found a lot of great stuff with it over the seven years it was my primary machine. But I didn’t fail to notice how my digger buddy’s White’s Electronics machines seemed to be absolute silver magnets. Of course, I came to appreciate over the years that a knowledgeable, experienced operator can find better stuff with a low-end machine than a beginner can with the best equipment available; but all things being equal, I began to see that certain machines do tend to find more of certain kinds of targets. When I dug with my friend, he routinely found stuff I didn’t, right where my coil had just passed over. And so the White’s machines stayed firmly on my radar. 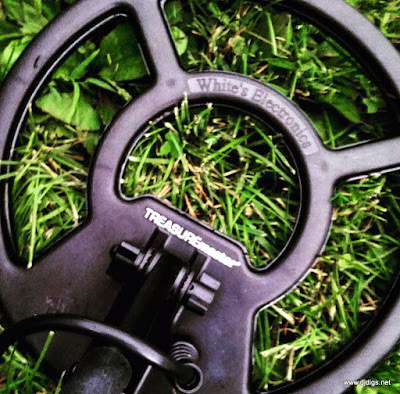 When it came time for me to upgrade after a full decade of hunting, I knew I wanted a waterproof machine so I could hunt underwater in our region’s many streams and rivers. The natural choice for me was the Garrett AT Pro, and that’s what I got. I like it, but it does have a pretty steep learning curve, and I was somewhat frustrated with it when a friend introduced me to the brand new White’s TreasureMaster. Now, I had used a White’s CoinMaster before, when another dig buddy lent me his for the day. It was a good machine, and I found some good stuff with it. But when he told me he was selling it, I declined to buy for two reasons: It was heavier than my 250, which is really an issue for me — my arm gets tired pretty quickly, and that can make for a short hunt. Secondly, I found the boxy control housing design unattractive not just aesthetically, but also because I could see how those sharp corners could catch on hanging vines (of which we have many here in Pennsylvania) and present the possibility of getting smashed or dented in the back of my car where I store my hunting gear. I also just didn’t see any major reason to change, since it seemed like a lateral move from my 250 rather than an upgrade. And there was that ever-present bugaboo for someone like me who has limited upper-arm strength: All the high-level White’s machines I’d held were just simply too heavy. I know I’d tire out from them within half an hour. But when my friend showed me the new TreasureMaster, and I watched how it just worked as a turn-on-and-go machine, I was intrigued. I helped him run a display at a local community fair, including a test garden for attendees to try their hand at dirt fishing. He debuted the TreasureMaster there, and it was fun to watch even little kids be able to just pick it up, swing it over the box, and find the coins we’d planted there. Sure, it was set up for them to succeed, but the dirt didn’t know that, the machine didn’t know that, and the kids didn’t know it. Even a few adults gave it a shot, and there wasn’t one of those who tried that didn’t come away with a smile when they heard that tone and dug a nice old Buffalo nickel or a sweet old Wheat penny. By the end of the day, I was itching to try my hand with it, so my friend let me borrow it in return for writing this review. It didn’t have to be a positive review, just an honest one. And what a good trade that was! First of all, the TreasureMaster is a machine that you can literally use right out of the box, even without reading the user manual. Now, I don’t recommend that, because I truly do believe that you can handicap yourself by not getting everything out of your equipment that it offers, just because you’re unaware of certain features if you don’t read the manual. But let’s face it: If you take delivery of a new machine just in time for a hunt with your buddies, you don’t want to have to slog through the manual just to take it for its first spin, and I’ll admit that’s what I did with the TreasureMaster. But I did read the manual later, and I’m glad, because I learned a few things I hadn’t figured out in the field. But the point is, the machine is so easy to use that you mostly CAN figure it out on your own. That’s important for a machine that’s marketed as an entry level model. However, this is where I must take exception with White’s: With all due respect—and not to imply that they don’t know their own products—I’m sorry, this is no entry level machine. Sure, beginners can absolutely use it, especially based on what I just explained about its ease of use. But seriously, the features, functionality and performance far outstrip ANY entry level machine I have ever used. My original Garrett Ace 100 was a true entry level machine, and it came at a true entry level price, under $100. It had minimal discrimination and no pinpointing feature and my holes were as large as trash can lids as a result. Truthfully, it was a kid’s toy and I’m still amazed I stuck with the hobby for three years using it. My Ace 250 is still considered an entry level machine, but at a price point around $225, it is far better designed and has a full feature set that happily took me through the end of my first ten years of hunting. Then came the AT Pro this past spring, and this is where all this background matters: After having used the AT Pro for three months, I was just beginning to feel comfortable with it. I was finding stuff, but nothing I hadn’t been able to find with my 250, though I hadn’t yet had a chance to try it underwater. I liked it, but I wasn’t in love with it the way I had been with my 250. Then along comes the TreasureMaster. That changed everything. It was so nice to find another machine that was quick and easy to set up, was in fact lighter even than my AT Pro, and that just worked, right out of the box. That it was a White’s machine was icing on the cake for me, because I knew they make real quality detectors that find the good stuff. The first time I tried it out, when I actually left my own machines in the car, was at an old farm established circa the mid-1700s. It belongs to some friends and I have hit it, along with some of my digger pals, many times. But it was the first time this year, meaning that whatever the winter frost heave brought to the surface was there waiting for us. I’ll say right now that I haven’t found anything truly outstanding with the TreasureMaster, but that is decidedly NOT the fault of the machine. Rather, it’s a reflection of the fact that I have struggled this year with being unable to secure many new permissions, and those that I have simply didn’t contain the rich offerings I had hoped for. Nevertheless, at this old farm, I had a good signal within thirty seconds of putting the TreasureMaster’s coil to the ground, for the first time in a real hunting situation. As I said, we’ve all hit this spot pretty hard, so I was truly surprised. Turns out the owner had been doing some repairs to his copper gutters, and I was finding his construction slaw at first; nothing to sneeze at, since I do recycle my junk finds and copper prices are very attractive right now. But the third target I found really was a gem, even without having any intrinsic value. 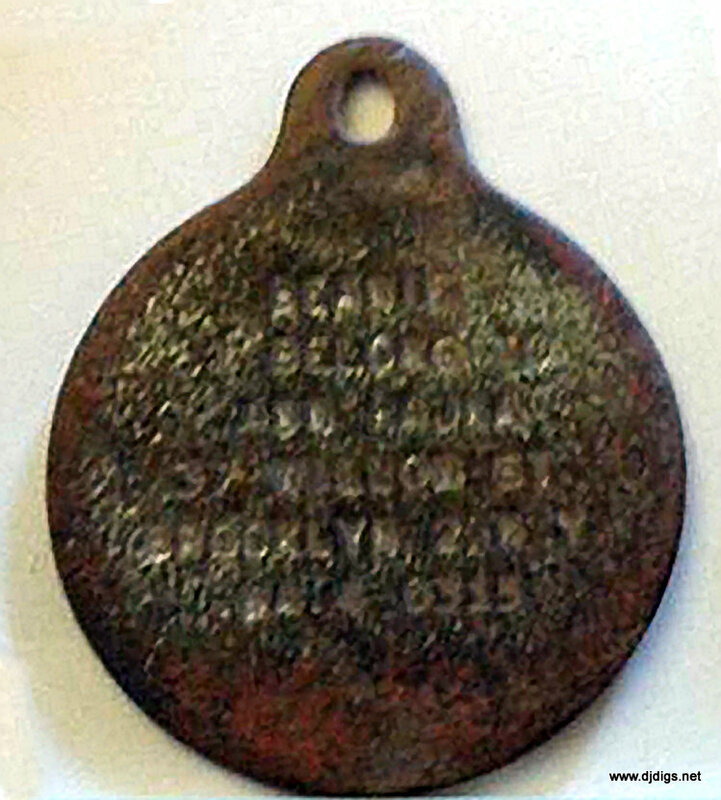 It was a beautiful old dog collar tag; not a license, but an ID tag for a mutt named Beanie, who belonged to someone in Brooklyn, NY, back when phone numbers had just four numerals. That tag had clearly been in the ground there since at least the 1950s, and I know I’d passed my own coils over that spot numerous times, as had other friends. But the TreasureMaster was the one that found it! This may be due to the fact that the TreasureMaster more than holds its own in trashy ground. That’s what I’ve been frequently hunting this summer, and the discrimination power of this machine is just outstanding. There was more than one time when, had I been using my Ace 250 (and possibly even my AT Pro in Standard mode) that I know I’d have passed over a coin or small relic because it would have been overshadowed by the obnoxious grunt of iron. You can imagine my confidence in the machine was already high, but I do believe this find was largely due to one feature of the TreasureMaster that simply blows my mind: the built-in pinpointer. Both my Ace 250 and my AT Pro have this feature, but it’s nowhere near as dead-on accurate as that of the TreasureMaster. With the White’s machine, when you activate the pinpointer, you get an audio tone that reaches its highest point and then just locks in solid, smack in the middle of the coil. When that happens, you can have absolute, 100% confidence that your target is directly under that point. That, my friends, is almost worth buying the machine all by itself! On both of my Garrett machines, the pinpoint feature is nice, but after all these years, I’ve never quite figured out exactly where that “sweet spot” is on the double-D coils I use primarily on both. Now, this may have something to do with the fact that the TreasureMaster has a round coil and therefore the center’s easier to find, but who cares why it happens? I just know that when I lock in on a target with that TreasureMaster, I know right where it is horizontally, and my only guess is how deep. Which brings me to depth indication on the TreasureMaster. I know you can adjust for units of measure in the Options, but it seems a rather moot point, since I couldn’t discern any actual inch readout on the display. However, I quickly learned that it didn’t matter, because just using the visual relational imagery at the bottom left corner of the display, I rapidly became accustomed to having a sense of how deep the target was. The irony here is that, even WITH inch readouts on both my later Garrett machines, it’s always a guessing game. I frankly just think that no machine I’ve ever used has been all that accurate with specific numbers when it comes to depth, so the TreasureMaster indicator without such numbers is a far more honest depiction of how deep the target sits. I appreciate that! Another more advanced feature is the TreasureMaster’s Silent Search threshold. This is a factory default audio setting, meaning you only hear tones when a non-junk target shows up in normal hunting modes. This is a boon for beginners, who have so many other things to think about, that not having all kinds of unidentifiable sounds in their ears eases some of the distraction and confusion. More experienced users can override this setting by switching into All Metal mode, if they don’t mind having some background hum in exchange for being able to hear faint signals that may indicate deeper targets. Or, this can be adjusted on-the-fly by simply hitting the “Up” or “Down” arrows next to the Options button while searching in any mode. Quick, easy, done—gotta love that. Speaking of the visual display, I really like the dial-like setup for the discrimination ranges. It’s easy to understand, it’s large enough to actually see (this is really important and not much talked about), and as a very visually oriented person, I appreciate the different color bars that help me quickly differentiate between metal modes—very helpful. It’s easy to flip through the options on this machine, easy to make adjustments, and easy to understand the different metal tones, once you’ve used it a while. That it offers a few different audio indicator tones that you can set for your preference is just gravy. Though I tried all the settings and programs on the TreasureMaster, I mostly tended to stay in Coin & Jewelry mode. It’s perfect for how I mostly hunt, though I did flip it over to All-Metal (which I consider Relic mode) at that old farm. These simplified programs make it really easy for the beginning hunter to not have to fiddle with everything just to get out in the field and get it going, but it’s nice to have the ability to customize your experience if you wish. That’s one feature I think takes the TreasureMaster out of the range of a simple entry level machine. Another is the automatic ground balancing. Now, I know some old-timers pride themselves on being able to manually balance their machines, and I’m aware that some feel it has a significant bearing on being better able to find the good stuff. I won’t argue that, but beginners are only intimidated by this level of detail, and I daresay many intermediate level users are, as well. I know I certainly don’t understand that whole ground balancing thing, even after a decade+ in the hobby. So I truly appreciate that I don’t have to pump this thing up and down and wonder if it’s even doing any good, anyway. The same easy, on-the-fly adjustment for discrimination is also available for sensitivity, by hitting the “+” or “-“ buttons. This was of particular use to me with our highly mineralized soil around here. I will say that the TreasureMaster’s performance in this matter was similar to all other machines I’ve used: There’s a certain amount of ground noise that registers constantly, and in All-Metal mode, especially with the volume turned up and no headphones, it’s not insignificant. That said, neither is it distracting, at least for me. The TreasureMaster also found similar amounts of hot rocks and other generalized falsing as other machines, but I don’t consider this the machines’ fault. We just have really mineralized, iron-rich, noisy soil. In trying to be fair and decide if there were any drawbacks to the TreasureMaster, I’d have to say it’s this hum (which, again, I don’t find annoying), and the fact that if you’re a really tall person, you may find the machine a bit too short for you. It definitely doesn’t extend as far as either of my Garrett machines, by a few inches. But since I’m average height, it’s not a problem for me, nor for most folks. But if that’s the worst you can say about a supposedly entry level machine, I simply can’t help but be impressed. Given that I felt the need to compare the performance of the TreasureMaster not only to its comparable price range peer—the Ace 250—but also to a machine twice its cost and considered a solid intermediate range machine—the AT Pro—I just can’t consider this a beginner’s detector. I suppose the really telling thing is that I know for a fact that I’m going to miss having the TreasureMaster as an option to choose next time I go out detecting, despite the fact that I still have a brand new AT Pro waiting in the car. For any number of reasons we all have our preferences, but my goal as a dedicated detectorist is to maximize the possibility of finding quality, valuable stuff in the ground, while digging the fewest possible holes and the least possible junk. Any tool that will make that easier and more likely is something I’m open to. So, at least where the TreasureMaster is concerned, this Garrett gal has a warm place in her heart for White’s Electronics products. 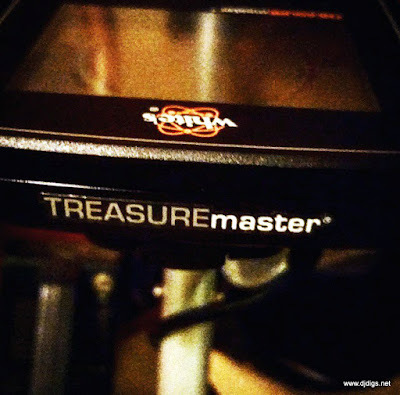 I feel lucky to have gotten the chance to try out this awesome little machine, and can definitely see a TreasureMaster or TreasurePro in my future. DJ: Once again I believe White's outdid themselves with this new Treasure Series. I look forward to getting more familiar with this machine. 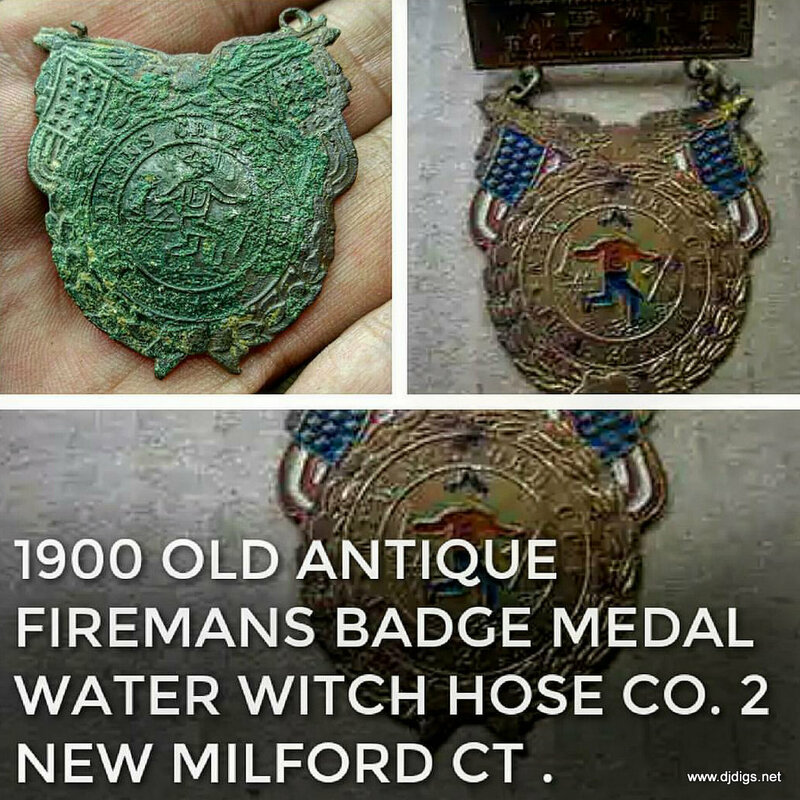 In the limited time I did use it, I managed to find this fireman's badge. 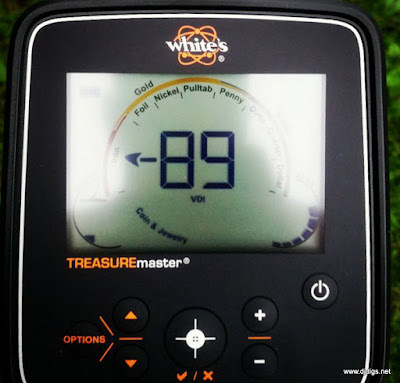 Stay tuned for an upcoming review on the Treasure Pro.